After spending more than a week in isolation struggling with the Ebola virus, American freelance journalist Ashoka Mukpo is finally recovering. Mukpo worked with the Sustainable Development Institute, a Monrovia-based NGO, for several years, until flying home flying home to the United States for a few months earlier this year. But after widespread interest and concern from the international community regarding the outbreak and reporting on the Ebola epidemic, Mukpo returned to Liberia in May to objectively document the transmission of the virus and the suffering of ill patients. He worked as a freelance journalist with various media organizations, including VICE News and NBC, until contracting the virus in September. After falling ill, Mukpo was transported back to the U.S. where he is slowly recuperating. Although there are obvious risks to reporting from the middle of the Ebola epidemic, there is also a critical need to keep the public informed. Transparency in reporting has been one of the many issues surrounding access to information on the Ebola outbreak. Liberia, the country hardest hit by the recent epidemic, has been accused of attempting to suppress journalists reporting on the crisis using questionable tactics. Liberia and neighbouring countries heavily affected by the virus have all been accused of media censorship to cover up the extent of the outbreak. Heavy censorship allows the governments of these countries to promote inaccurate perceptions of the situation, and appear to be winning the fight against Ebola. This public-facing image is contrary to the truth; governments struggling to adequately address the situation warranting international intervention on the crisis. Medical professionals working in Liberia have been banned from communicating with media, and the government has been “quarantining” journalists and preventing them from reporting on the situation, often citing the privacy of patients as their justification. The Press Union of Liberia has been an active and critical voice in publicly speaking out against attempts by the government and police to muzzle journalists reporting on the spread of Ebola. During the initial stages of the outbreak, members of the press were not on the list of professionals exempt from the nine-hour curfew imposed under the country’s Ebola state of emergency. While this decision was later reversed, several journalists were detained by police and prevented from reporting. Independent newspaper the National Chronicle was arbitrarily closed and its offices were raided on August 14, shortly after the Liberian Minister of Information Lewis Brown publicly warned journalists against reporting critically on the state of emergency. Police raided the offices in Monrovia with tear gas, assaulted a number of reporters and seized computers and documents. No explanation or reason for the raid was given at the time, and a blanket statement citing ‘urgent national security concerns,’ was provided days later. Although Liberia’s constitution provides for freedom of the press, local media organizations are often threatened and attacked for critical reporting. The country is still in the process of decriminalizing defamation, and there are few concrete laws or policies in place to protect journalists and freedom of expression. 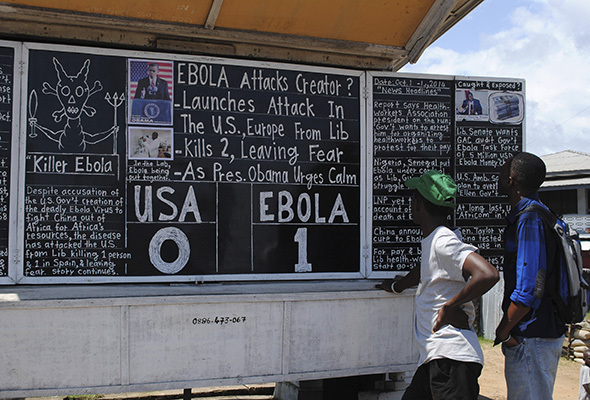 Liberia is not the only Ebola-stricken nation trying to prevent free reporting on the virus. In neighbouring Guinea, soldiers prevented members of the media from investigating the murder of eight people, three of whom were journalists, killed during a visit to educate villagers on Ebola in September. This is despite the fact that the media had received permission from local officials to visit the site of the murder. The government in nearby Sierra Leone has also reportedly threatened to take measures against reporters who write critically about the nation’s response to the outbreak. A report released on October 17 by the World Health Organization stated that there have been “9,216 confirmed, probable and suspected cases of Ebola virus,” over half of which have been deadly. At least 1,800 of the deaths have been in Liberia; more than 90 of which were healthcare workers treating infected patients. As Ebola continues to spread, transparency and critical reporting are essential tools to address the situation and highlight shortcomings of local governments and organizations. Ashoka Mukpo’s story highlights contemporary threats to free expression. Difficulties and dangers in reporting are not only in areas of war or conflict, but also in those hit by widespread health epidemics or natural disasters. Situations like the Ebola epidemic not only come with life threatening risks to health and safety, but also obstacles put in place by local governments to veil themselves from criticism at the expense of the truth. When Guinean government officials, medical professionals and journalists attempted to educate the people of remote villages on the virus, they were attacked and brutally murdered by the locals who believed the officials to be spreading Ebola. By censoring the media and infringing on fundamental human rights, governments like those in Liberia, Guinea and Sierra Leone are creating even more obstacles in the fight against Ebola, preventing access to accurate and timely information and promoting uncertainty about how best to control and treat the virus. Clare Shrybman, a graduate of the post baccalaureate journalism degree from the University of King's College, is a freelance journalist in Toronto.